Many people just know, from an early age, that someday they will start a business. They have a plan. They are determined. And they know exactly how it will unfold. This wasn’t the case for Katie and me. In fact, neither of us ever envisioned starting our own business, let alone start a business doing something we enjoyed doing for fun—with one of our closest friends. Katie and I are often asked about the start of Blue Pencil Home and what we wish we knew before beginning. For today’s post, we share just this. Today is the first of a three-part series about Blue Pencil Home’s business beginnings. We’ll share how and when we knew we had a real business idea and all about our first steps in forming Blue Pencil Home. Next month we’ll share more behind the scenes details such as what we wished we’d known before starting and the amazing people who’ve been integral in our work. We can’t stress enough how much we’ve been supported by many people. In June, we’ll wrap up our series with our biggest successes and the major obstacles we’ve overcome in starting our organization and decluttering business. Raise your hand if the thought of decluttering your bedroom closet makes your heart beat a little faster. Or if you feel an instant sense of doom… and confusion. The I-have-no-idea-where-to-start syndrome is real, my friends. And I have a feeling there’s a lot of hands in the air right now. That means you’re not alone. Here’s the thing—there are plenty of magazine articles and ideas all over the web about organizing a closet. And I’m going to venture that a good many of them can be intimidating and time consuming. And you still won’t know where to start because it all just sounds like a lot of work. What if we went a different direction and said that giving your closet and wardrobe a spring refresh can actually be fun and not intimidating in the least? With spring break coming up we wanted to share some tips on packing for the family. Confession, I used to be a chronic overpacker. I was scared I wouldn’t have enough choices so I would throw everything and the kitchen sink into the largest piece of luggage I had. I cannot tell you how many times I came home with over half of the items never worn, yet, they still had to be laundered because they were wrinkled and re-packed with dirty clothes. Then one fateful trip to Sweden I learned the error of my ways. After a cancelled flight, a missed connection, four layovers and 36 hours I arrived in Stockholm, but sadly my luggage did not. 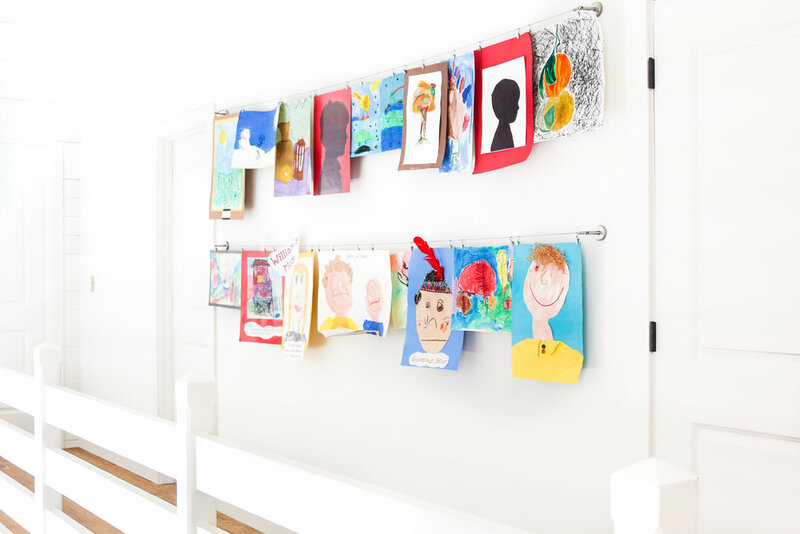 When it comes to organizing your child’s many masterpieces there are two important steps: Deciding what to keep and then how to store or display what you’ve decided to keep. To begin you’ll want to gather all the art you can find around the house in one place. Go through the entire house and pull out all the little pieces of art you can find from the attic, the backpack, the refrigerator door, the junk drawer, under the bed — basically wherever there might be a piece of paper with a scribble on it. Once you have all the art in one place, go through it completely and make piles of the items you’d like to keep. If you have more than one kiddo be sure to keep pieces separated by child, so you can store or display them together without mixing them up. Once everything is separated it’s time to decide what stays and what goes. Sign up with your email address to receive news and updates about our special projects and offerings. We respect your privacy and do not provide your information to any third party sources. Can We Keep You In the Loop? Thank you for signing up to receive information about our projects and offerings. We will be in touch soon!